One of mightiest VIDEO advertisement solutions lately. At first user sees the portal, which is decorated with the background video. When user presses the “VIEW” button (located on top left), a wonderful video expands and covers the entire website. The solution draws attention and attracts with the vivacity, which it brings to the portal, and with a non-standard approach to advertising. Whiskey" Grant's "campaign is based on the strong global #paldiesvecit or #IOU campaign idea, which we want to promote in Latvia. Since the campaign roll video length is too long to suit pre-roll needs and fit in standards, but the curtailment of the clip would fail to pass the brand idea, we needed to find an effective solution to attract people's attention and allow them to watch the entire clip. Previously we had created similar advertising solutions that pushed the edge of the site for maximum exposure of the campaign idea, but for the first time we have created a video solution. This type of video advertising, in our opinion, is one of the most impressive video solutions made in Latvia recently and it is more user-friendly. " We used this solution to create associations of new D-Light blackcurrant flavor and inspire customers to try it. 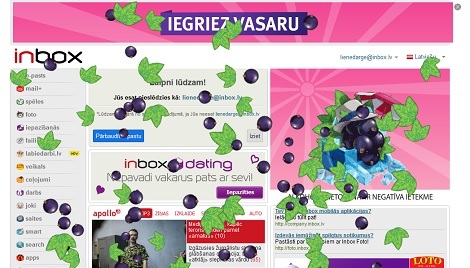 In addition to transparent part ,where the falling blackcurrants drew the attention of users, static banners also allow the user to explore the offer. This option's efficiency was much bigger than any other solution used in the campaign. Price of non-standard solutions depends on many factors. Implementation of each idea needs different resources and individual approach. 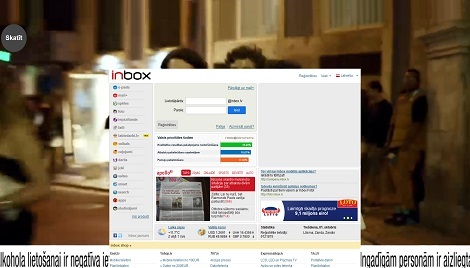 Often implementations may require different banner places and their combinations in Inbox.lv products. Therefore, the final price is set individually, assessing all of the above factors. Inbox.lv team always reviews new ideas with great interest and offers interesting promotional solutions in their products. If you have an idea, feel free to contact one of our advertising project managers. After discussing the details, You will find out how your idea can be realized not only technically, but also get the advice how to grab the attention of users.